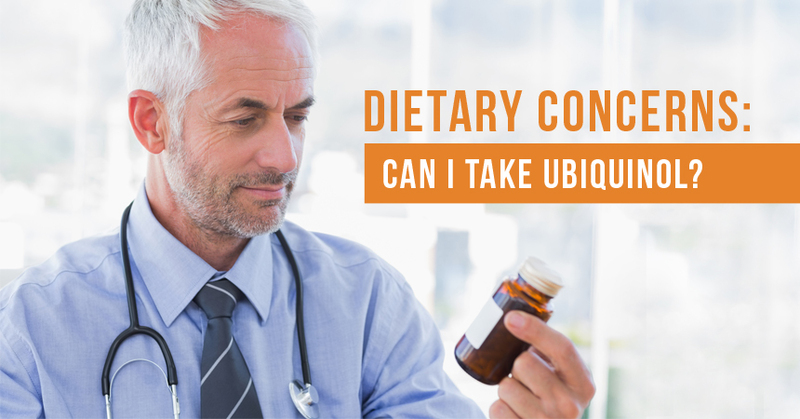 Dietary Restrictions: Can You Take Ubiquinol Supplements? If you’re a vegan, vegetarian or someone who tries to eat only GMO-free food, chances are you're probably concerned about what you put into your body and are very aware of where it comes from in an effort to live a healthy, responsible, and socially conscious life. And it's likely you have the same concerns about any vitamins and supplements you take. Whether because of allergies or due to dietary restrictions, individuals with dietary concerns will naturally have questions about what is in any supplement they take, including Ubiquinol, as well as how it’s created and what manufacturers use to encapsulate Ubiquinol. Whether Ubiquinol supplements are appropriate for people who are vegan or vegetarian, those who have allergies to certain foods, or for people who try to eat GMO-free food depends on the manufacturer and the specific brand of Ubiquinol supplement. Kaneka QH Ubiquinol is the main ingredient in more than 135 Ubiquinol supplement products. Ubiquinol, which is the active, antioxidant form of CoQ10, needs to be emulsified in oil to keep it in the Ubiquinol form; otherwise, it converts to the oxidized form of CoQ10 called Ubiquinone, which is the inactive form of CoQ10. Fun fact: All Ubiquinol supplements are manufactured and sold as gel caps or in liquid capsules in order to protect the unstable Ubiquinol from air and prevent oxidation, which then turns it into Ubiquinone. Ubiquinol supplements are manufactured by different brands that encapsulate Ubiquinol. Therefore, it’s important to contact the different supplement manufacturers to ensure it suits your dietary needs because, as with most products that contain the same active ingredient, they are likely manufactured differently and use different inactive ingredients. Most Ubiquinol supplements are sold online, so it's easy to search for Ubiquinol brands then view the ingredient list and supplement facts label for each specfic brand on the retailer's website. Do Ubiquinol Supplements Contain GMOs? A genetically modified organism, or GMO, is a living organism – plant or animal – whose genetic material has been altered by genetic engineering. The term “GMO” is becoming an increasingly important and familiar term among consumers who are concerned about what they eat and the effects on their bodies and overall health. Ubiquinol itself, which is naturally cultivated from yeast, is free of any GMO ingredients. However, you should always check with the specific supplement manufacturer about any other ingredients used in the manufacturing process for the presence of GMOs. Are Ubiquinol Supplements Considered Vegetarian or Vegan? Because Kaneka QH Ubiquinol is naturally cultivated from yeast, it is free of any animal products and is considered vegan. However, some encapsulation ingredients may contain gelatin, which is derived from the skin, bones and connective tissues of animals, such as pigs, horses and cattle. Ask the manufacturer of your particular brand of Ubiquinol supplement about the other ingredients used that may have the presence of gelatin or other animal products, such as fish gelatin and beeswax. Do Ubiquinol Supplements Contain Soy, Nuts, Gluten or Other Allergens? Kaneka QH Ubiquinol does not contain any soy, nut or gluten allergens. But customers should be aware that some manufacturers use oil expelled from soybeans or sunflower oil to emulsify the Kaneka QH Ubiquinol. If you have sensitivity to soy, nuts, gluten or other allergens, be sure to check with your brand manufacturer to confirm they are not using allergens or have traces of allergens in the inactive ingredients of the supplement. Many manufacturers also include beeswax in the supplements. Although people who are allergic to bee stings are not usually allergic to beeswax, it is something to be aware of because beeswax itself can be an allergen. Always check the supplement facts label and contact the manufacturer with any questions. As a standalone ingredient, Kaneka QH Ubiquinol would be considered kosher, but Kaneka QH Ubiquinol is never a standalone ingredient; it's only available in Ubiquinol supplements. Many Ubiquinol supplements are not kosher because they contain gelatin, which is made from animal by-products, including pork and pork skins. However, there are many brands of Ubiquinol supplements that are certified kosher and use vegetable cellulose, microcrystalline cellulose and silica instead of gelatin. Kaneka QH Ubiquinol is GMO-, nut-, wheat- and dairy-free and is also suitable for vegetarians and even vegans. Kaneka QH Ubiquinol is the main ingredient in all Ubiquinol supplements. However, consumers need to be sure to check with the manufacturer of their particular supplement brand to see if any inactive ingredients, such as those used in the encapsulation process, contain substances unsuitable to certain diets. To learn more about Ubiquinol and how it can promote both heart health and overall health, check out the Facts Sheet for more information or download a list of questions to ask your doctor about Ubiquinol before you begin to make the supplement a part of your daily routine.